The global movement of horses has increased dramatically over the last few years. The challenges of facilitating travel to new and diverse locations whilst ensuring horse comfort and safety have never been greater. Over recent years Peden has been involved in increasingly complex shipments and been asked to lead increasing diverse health negotiations. It became clear to us that in order to maximise our level of service to our clients we needed to establish a veterinary element within our team. Our in-house veterinary adviser is a highly experienced regulatory veterinarian and is in daily contact with the Ministry vet departments across the world. Not only do we now provide more specific veterinary advice to our clients for regular shipments but we are also in a position to push forward the boundaries of international movement of horses. Peden have a comprehensive network of government, veterinary and academic contacts worldwide who we work with on a daily basis to address challenges in the international movement of horses arena. 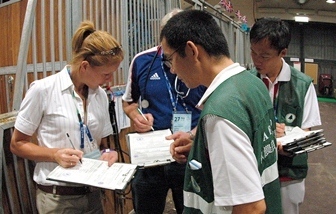 Peden Bloodstock worked closely with Chinese government officials, airport stakeholders and vets in the EU, China and across the hub countries throughout Asia to facilitate the establishment and use of an Equine Disease Free Zone in Conghua, China for the period of the Asian Games in 2010. Peden Bloodstock worked with the Chinese Government Officials to assist in the negotiation with Europe and the other attending Nations to establish successful certification for horses travelling to and returning from the Games. As a result of the Equine Disease Free Zone and the establishment of sensible health certificates and protocols the horses were able to come to China from all over the world and compete at the prestigious Asian Games. Following competition the horses were able to return to their home countries. This was a significant milestone for the equestrian competition world.